Let me say at this stage that all of Scotland is stunning… (okay so I’m sure there are non-stunning bits such as the time we searched for a nice viewpoint to look across the Beauly Firth and ended up under the Kessock Bridge. Inverness turned out good in other ways as you’ll discover later) but some of Scotland is more stunning that the rest. The point being that if you are going to talk about the best road the scenery is a big part of it. However, if this award is to be anything more than the best view it has to consider the experience of driving the road. Two roads came into contention here and, perhaps, they owe their place to their locations in the landscape. Each takes you from the Great Glen to the west coast, one slightly north of the other. The A87 runs from the Great Glenn at Invergarry past Loch Garry, Loch Loyne and Loch Cluanie to Kyle of Lochalsh and across the bridge to Skye. The A830 is further south and runs from Fort William, through Glenfinnan and past Loch Eilt eventually to the port of Mallaig. Both roads pass along loch shores, through some wonderful mountains and along-side twisty tinkly rivers. On both these roads the mountains west of the Great Glen don’t seem as mahoosive as those on the Cairngorms but their slopes seem steeper and more immediate. As a result, the oohs and aahs of wonder as you sweep around the bends seem to come more often and with greater astonishment than amongst the larger Cairngorms to the east. In the end I have to give the award to the A87 as we did drive the full length of the road. 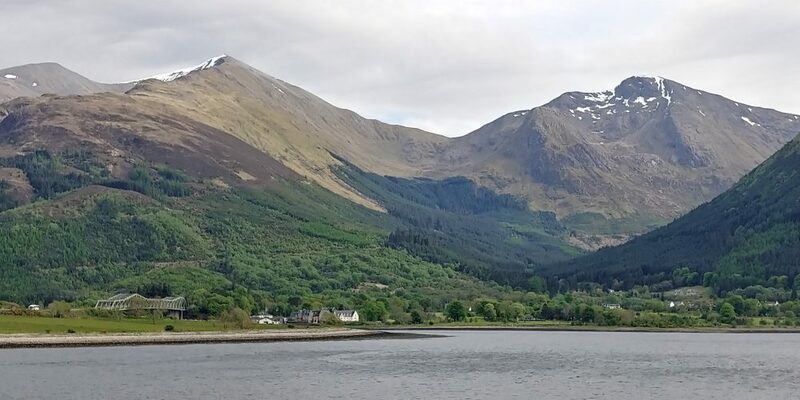 Had we driven the A830 right to Mallaig the decision might have gone the other way as the forested cliffs as you descend to Loch Eilt are stunning, but the on the A87 the mountains slope more gently down but really don’t stop until they reach the road. In this case I’m talking about a cooked breakfast and while it pains me to say it the Scotts give the traditional Full English a pretty good run for its money. We had some marvelous breakfasts and I should say at this point not one of the hotels or B&Bs let us down on the breakfast front, to the point that we both gained weight while touring. However, the best breakfast award was decided early on in our trip when we stayed at the Youth Hostel in Braemar where they don’t provide a breakfast. Therefore we were forced to improvise and in the village we found The Bothy. Now it is still a little unclear if The Bothy is a café with a substantial camping shop attached or is a large camping shop with a cosy little café attached. Suffice to say the breakfast at The Bothy was second to none, amongst some of the best cooked breakfasts I’ve ever had, and I’ve had a few I can tell you, especially in the last couple of weeks. The menu consisted of the usual bacon, sausages and eggs with black pudding, baked beans, etc. I can’t remember if they served haggis, which I had whenever it was available, but what I distinctly remember was that they served the smoothest coffee I have ever had. As we toured I found myself constantly comparing the coffee to The Bothy coffee and none came close. We stayed at a range of B&Bs & a few hotels where you might imagine the coffee would be excellent but to be honest one or two were not that great. The Bothy blew them all away. I’d return to Braemar again just for that breakfast. The award for the best accommodation is split into two categories, Best Hotel and Best B&B. The best B&B goes, without hesitation, to the Seadrift B&B located at Avernish, near Kyle of Lochalsh. As with the breakfasts there wasn’t a bad B&B amongst them. One B&B had a cramped bathroom, another had less than perfect coffee, many had less than adequate sockets for charging your phone, that sort of thing, but none of them was worth less than four stars on a well-known holiday website. However, Seadrift, run by an English couple who had moved there a couple of years before, was outstanding. The accommodation was luxurious and spotless, as is the standard these days. Despite the twin room we’d booked (the double already being taken) the beds were immediately pushed together and a pot of tea and cake was ready for us at the lochside when we arrived. Believe me, the parking was on the loch shore yards from the water. But the outstanding element was the breakfast room. Seadrift have gone for the option of a large communal table which is much nicer than the small tables where couples or families sit in subdued politeness attempting not to over hear or be overheard by other breakfasters. At Seadrift visitors are encouraged to share their experiences while having a breakfast that is equal to the Bothy (I just wanted to take the opportunity to include both in this blog), with scrambled egg unlike any I have had before. Visitors have the opportunity to look out across the loch where otters and eagles were seen during our visit, facilitated by a selection of binoculars just in case wildlife is spotted over the porridge or toast course. However, the final outstanding feature is that one wall of the breakfast room is covered with a large wallpaper map that displays Scotland from the western edge of Skye almost to Inverness in the east. This simple idea is such a bonus in that the hosts and visitors are able to discuss places to visit, distances, the types of roads for everywhere within a day’s travel. An outstanding B&B with restaurant quality food and a location that is second to none. The best hotel award was a difficult choice. 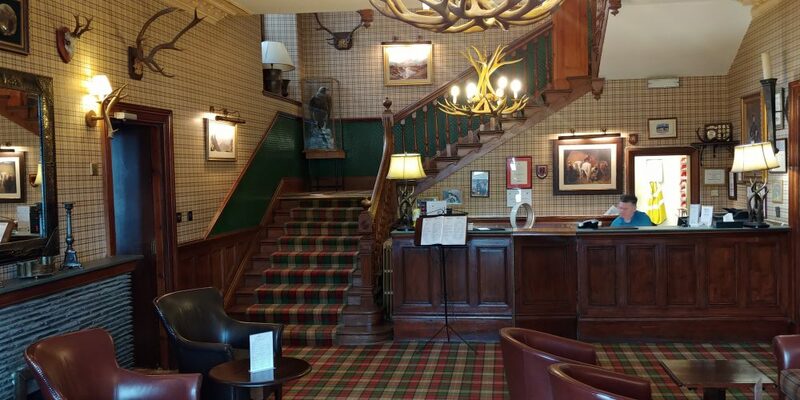 Early on in our trip we visited the Cairngorm Hotel, Aviemore and we loved it. At the end of the trip we indulged in two nights at Crieff Hydro, originally a Victorian Hydropathic health retreat. To be honest Crieff Hydro knocks spots off the Cairngorm Hotel in terms of grandeur and facilities and it was a hard decision to give the award to The Cairngorm Hotel but, from our arrival, the place had that highland feel with wood panelling with a magnificent staircase complete with antlers and a suit of armour in the entrance. Both hotels are stone built with turrets and generally gothic revival feel (although I’ve seen Crieff Hydro described as Scots-Jacobean). Despite Crieff Hydro offering a brilliant Victorian spa and an opportunity for me to drive a Landrover up and down some dangerous slopes, plus multiple golf courses, tennis courts, horse riding, etc., The Cairngorm had that authentic highland feel. Crieff Hydro, however, was just that little bit corporate despite still being run by descendants of the Victorian founder. With a buffet breakfast and hundreds of rooms it had a somewhat impersonal feel. I don’t suppose the bar at The Cairngorm offered the same range of cocktails as Crieff Hydro (having the full range of whiskies is a given with any bar in Scotland), the Cairngorm bar was more like a pub being full of locals watching football followed by a pub quiz. In the end the experience of descending the staircase for dinner at the Cairngorm Hotel, all antlers and oak panels, won the day. This award is a combination of last year’s award for Best Urban Sculpture and the award for Best Engineering Project. (Eh… last year? I don’t remember a last year. We went to Turkey and took photos of parachutes and the swimming pool.) So, the Best Local Regeneration Project award goes to Falkirk. Now, people were somewhat surprised when we said we were going to Falkirk on our world tour of Scotland. Despite claims of the town being voted most beautiful Scottish town in 2011 some people were less that complimentary when we told them our plans. After all the area, halfway between Glasgow and Edinburgh, in Scotland’s former industrial heartland has a reputation for urban decay, people losing their jobs to globalisation or the relentless march of technology; all that strife that goes with once proud towns becoming under-invested and overgrown. However, two additions since the millennium have put Falkirk firmly on the tourist map. 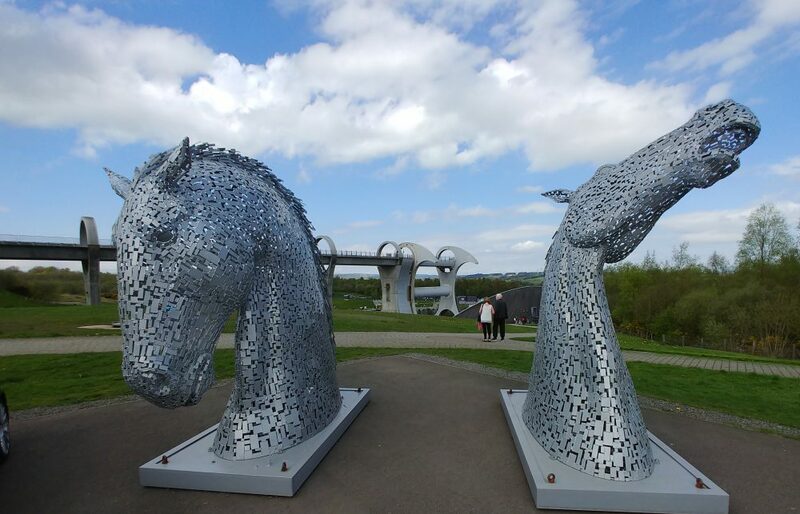 The urban sculpture part of this award goes to The Kelpies, two 100-foot-high, 300 tonne, steel horseheads in Helix Park, Falkirk, opened in 2013. 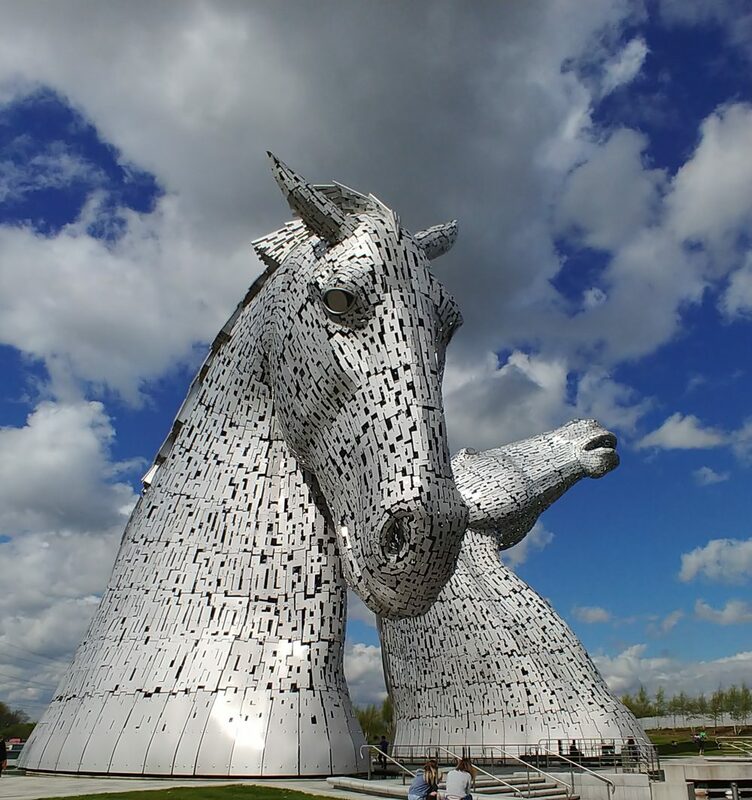 The Kelpies were designed by sculptor Andy Scott as a tribute to the legend of shapeshifting horses said to live in Scottish waters and to the history of heavy horses in Scotland’s industrial heritage. I just think they are bloody mind blowing and everyone should take the chance to see them if they can. Helix Park is a transformed industrial landscape now given over to civic recreation. The park is crossed by the same Fourth and Clyde Canal that is connected to the Union Canal by the Falkirk Wheel. A canal lock sits directly between the Kelpies, the two sculptures seemingly standing vigil above the waterway beneath. Honestly, it’s all rather wonderful. I don’t know the canal travelling time between the two sites but I’m sure someone is missing an opportunity here. I imagined arriving at the Kelpies early in the morning to see the giant sculptures in the morning light (they are completely transformed as the light changes through the day) have a cup of coffee or perhaps even breakfast in the Kelpies visitor’s centre, then a morning boat trip along the canal to the Wheel. There you would be entertained as you are lowered by the magnificent 1200 tonne engineering marvel, disembark in the marina to have lunch in the Wheel’s visitor’s centre. An hour later, after lunch, you might buy a fridge magnet and reembark to cruise back to the Kelpies for afternoon tea and a T shirt. I’m thinking gourmet café food specially laid on, a tour guide pointing out the industrial heritage along the way, stuff like that. I know of at least one old distillery bonded warehouse between the two sites that’s since been converted into a hotel that could be pointed out by an up and coming stand-up comedian or drama graduate moonlighting as a tour guide; you get the picture. 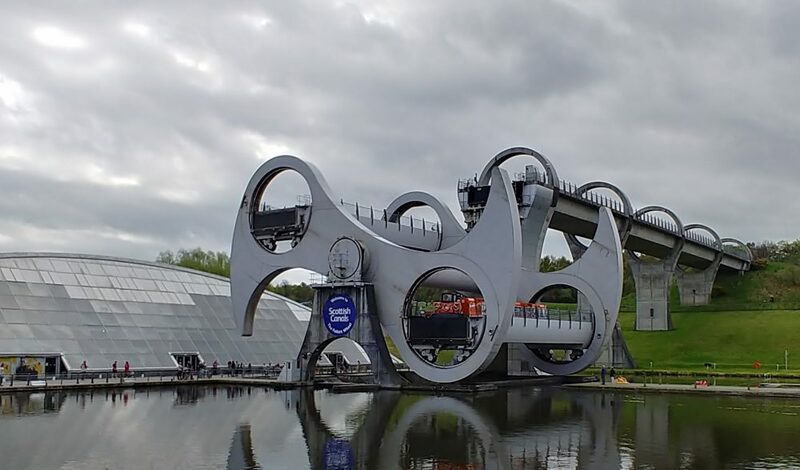 Anyway, I mentioned it to the guides at the Kelpies and it seems this isn’t on offer yet. Let me know if you are a waterways entrepreneur and you want me to make a speech at the inaugural trip in return for the idea. I’d say I’d be happy to turn up in return for all expenses and two night’s accommodation for two. Inverness was a bit of a surprise. We’d booked two nights in Inverness as we expected to need a bit of a break from the moving on every day after coming through the Cairngorms, but we hadn’t really planned what we’d do there. We had a nice B&B that we’d pre-booked a second visit to for when we returned from the Hebrides, so we had a second chance to look around. First of all, Inverness doesn’t get great recommendations in the guide books (although it’s possible we didn’t pay much attention to them before we left). When we first visited we discovered that they have illuminated the main bridge over the River Ness, added fairy lights to the trees along the river and illuminated the cathedral. This gives the city a pleasant atmosphere on a spring evening with trees in blossom having and just come into leaf. On the second visit we stumbled across the Hootananny which wins the award for best night out along with the city itself. This is an apparently renowned live music pub (clearly, we didn’t read the guidebooks again). After dinner in the excellent Castle Tavern we strolled the streets and stumbled across the Hootananny just as the music was getting started at 9.30. 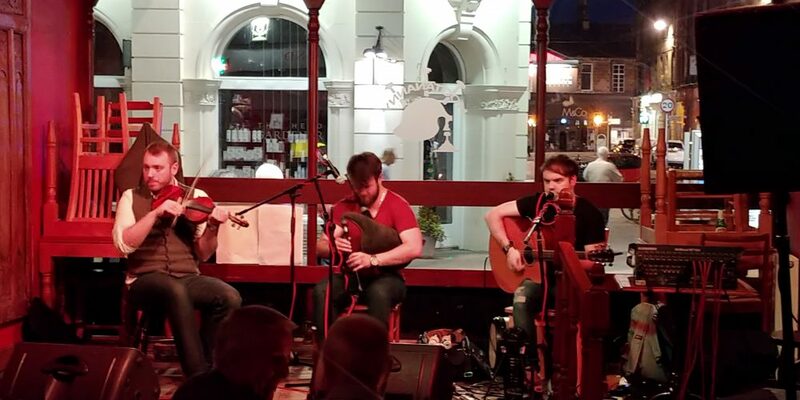 After chatting with a mix of locals and tourists at the bar, discussing favourite whiskies and favourite roads, the band fired up and played three great sets. (We didn’t catch the introduction but the website suggests it might have been Ali Levack with Charlie Stewart and Luc Macnally but the listings are a bit mixed up on the website so I’m not sure.) They had a good crowd dancing but we had to leave before they finished (early morning B&B breakfasts don’t go with too many late nights). People were arriving as we left and, with a turnover of people, the patient would be rewarded with a table if they wanted one. (I suspect many tourists were keen to get out and discover what else the city had to offer.) The evening was finished off with a peaceful walk back to our B&B along the sparkly river for the perfect night out with excellent food, lively entertainment and an atmospheric finish. My tweet that Inverness was much nicer than I’d been led to believe generated a great deal of interest. The claim in one guidebook that the city hides its charm behind ugly concrete buildings seems largely unfounded. This one is a bit of a cheat as I’m doing my best to spread the lurve and not offer awards to the same place twice. To that end I’m declaring the best evening meal to one we cooked ourselves. 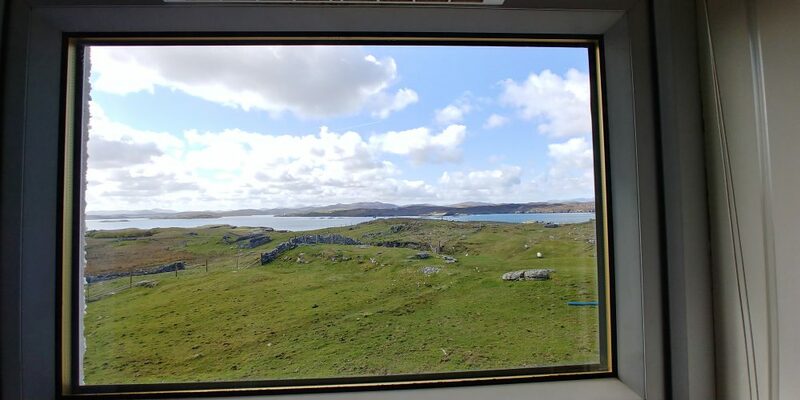 On arriving on the Isle of Lewis we headed to our accommodation in Tolsta Chaolais where our hosts ran a self-catering holiday let as well as running a smallholding raising Hebridean Blackface sheep and Highland Cattle. On our final evening at the cottage we had the most amazing locally produced venison sausages and potatoes while we watched Billy Elliot drinking beer from the Cuillin Brewery on Skye. Nuff said. This is another difficult award as, to be honest, they are all beautiful. Okay so Loch Tarff was a bit disappointing when we thought we were descending to Loch Ness but they can’t all be spectacular. In our case we didn’t get out onto any of the lochs so the award is really for best view of a loch. Therefore, the award goes to Loch Garry for the view from the high layby on the afore mentioned A87 just before it heads north away from the loch. 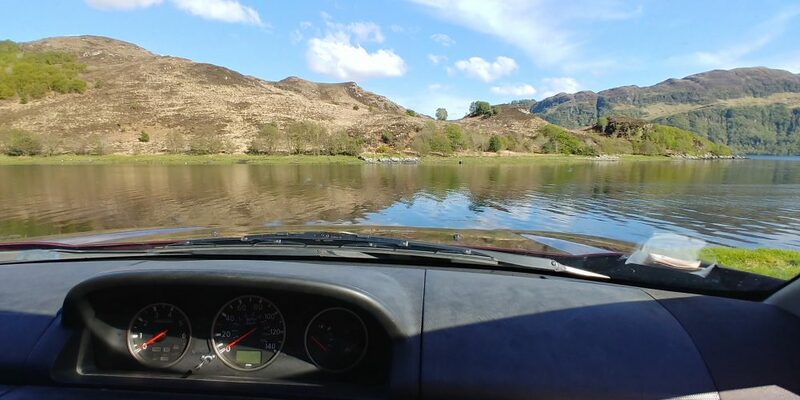 To be honest, the view was much better from an unofficial layby, a small patch of bare earth, about half a mile further on where the loch can be seen miles into the distance but a Range Rover had grabbed the spot so no photographic evidence is available. I’m guessing you know what’s coming here, just another excuse for a picture of a nice view. However, this one’s got to be largely an image of a mountain so this goes to Streap (I think that’s the one) north east of Loch Shiel in the West Highlands. The view of the mountain is stunning in that the south west face features a magnificent couloir (or crevice). 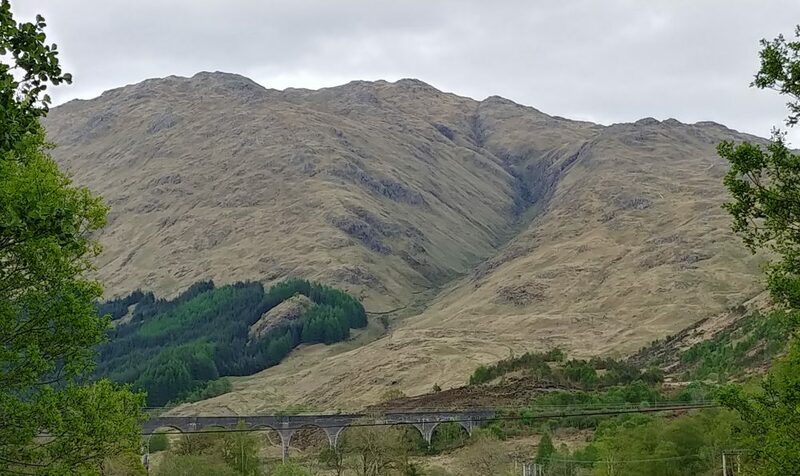 The location is more interesting as the mountain overlooks the Glenfinnan Viaduct featured in the Harry Potter films which the Hogwarts Express passes over during many scenes with flying cars and attacks from dementers and the like. From a suitably high viewpoint, if you turn the other way, you can see past the Glenfinnan Monument (that commemorates the start of the Jacobite Rising) to Loch Shiel. The loch, to my mind, looks just like the loch on which Hogwarts stands. I reckon JK Rowling must have holidayed here at some point. This category is easy as we only really visited one castle, unusual for me. And the award goes to Eilean Donan Castle. Ironically Eilean Donan Castle, which features in so many films including Highlander, isn’t a real castle at all. There was a castle on the island dating from the medieval period but it was partially demolished by the mid 14th Century. During the Jacobite rising the castle was used again with extra fortifications that had been added in the 16th Century. By the late Victorian period Eilean Donan Castle was a ruin once more but in 1912 the new owner, John MacRae-Gilstrap, began a reconstruction project that created the castle that can be seen today. Effectively Eilean Donan Castle is a fortified house in the style of a castle similar in that aspect to other Scottish castles or tower houses that are made to be more comfortable to live in than medieval castles. Whatever its provenance Eilean Donan Castle is a magnificent structure and well worth a visit situated not far from Kyle of Lochalsh, but even closer to the Seadrift B&B. 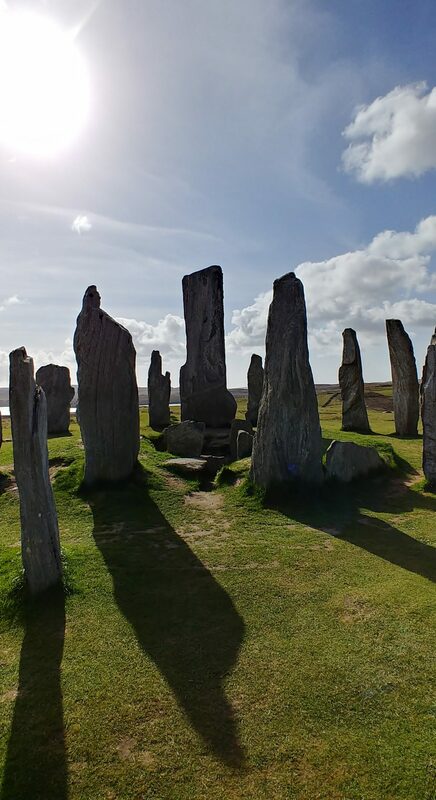 As with the Best Castle category (and best urban regeneration, best bridge and just about everything else) we only visited one stone circle and that was Callanish Stones on the Isle of Lewis. This imposing stone circle, about 4500 years old, includes three radial arms of stones roughly from the west, south and east and an impressive avenue from the north(ish). There is a burial chamber (probably added later) just inside the circle beneath the central stone which is almost 5 metres high. Otherwise the site speaks for itself and its an excuse for me to include some more photographs.